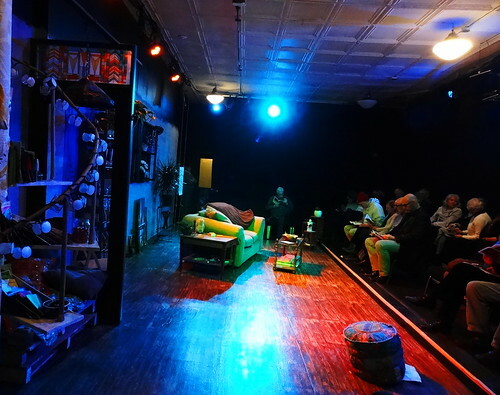 We’re in Southwest Detroit to catch a show at the Matrix Theatre on Bagley. Founded in 1991 by Shaun and Wes Nethercot, the company’s mission is “to build community, improve lives and foster social justice. 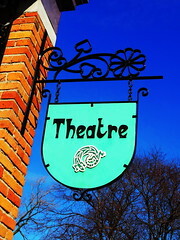 Matrix Theatre Company teaches, creates and shares theatre as an instrument of transformation”. In addition to professional theatre the company also includes the School of Theatre, Matrix Teen Company and the Community School For The Arts which teaches play writing, performance and puppetry for all ages. 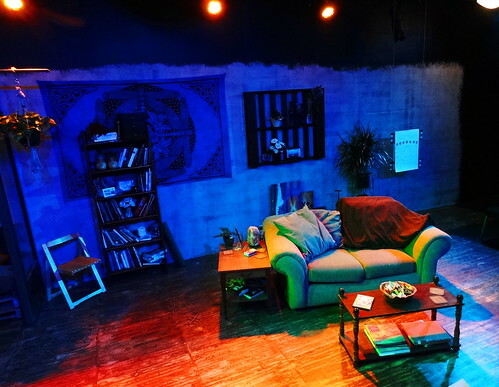 Members of the groups collaborate to create new plays about important community issues such as teen dating violence, bullying, gang violence, immigration/deportation, HIV/AIDS, homophobia, ethnic intimidation. They also bring awareness to the history and culture of Detroit. 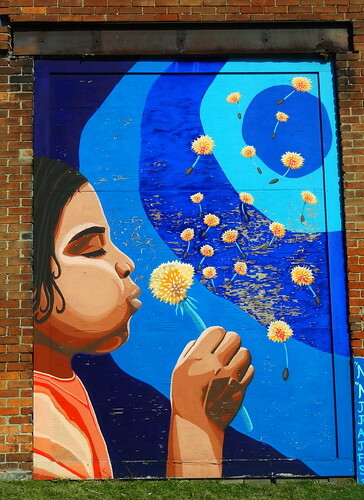 We park in the lot adjacent to the building, for years I have admired the mural on the wall; a young girl blowing dandelion seeds into the air, her eyes closed tight concentrating on her wish, other dandelions join the dance in the breeze. 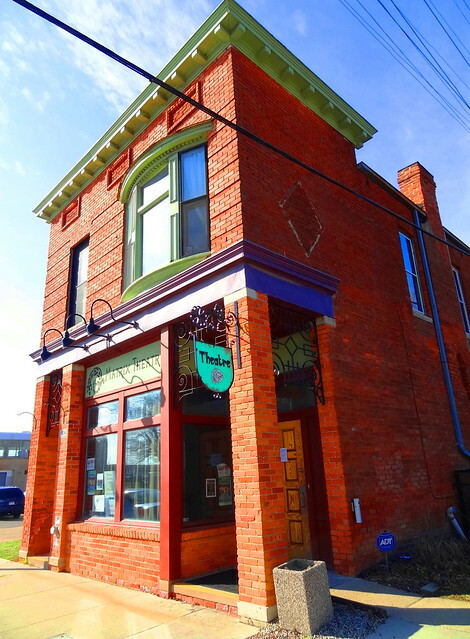 The orange brick building stands 2-stories high, a wrought iron hanger holds the Matrix shingle. 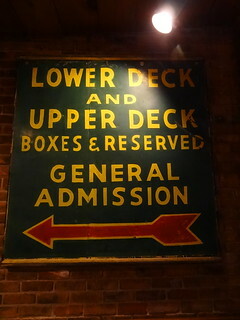 Inside the lobby is compact; here you can pick up your ticket, grab a candy bar and a cold pop before heading into the performance space. Intentions is sold out today, we spy two open seats next to one another and claim them. The theatre is one of those intimate spaces where the people in the front row are practically on stage; you can’t help but feel the energy from the actors. For the next two hours Nell, Gabe, Maya, Leif and Lou share their lives at Tillerman House with us. Tillerman is an intentional community/urban farm, the characters share common values but each one views life a little differently. The entire story takes place in the common area of the house. 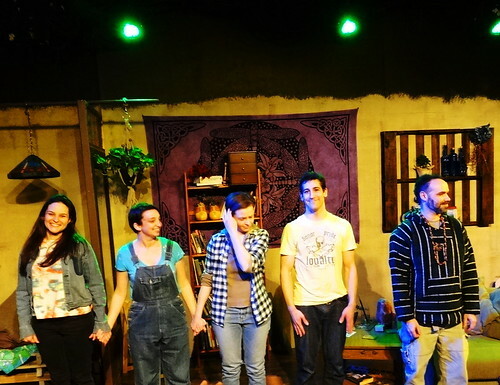 Playwright Abbey Fenbert has created a funny, entertaining, honest look at the effect change has on human beings. I too experienced change; I felt one way about the characters at the beginning, then as things happened and the story evolved I saw a different side of them, altering my view. Things are always shifting, we’re always looking for balance. The actors are marvelous, the story timely, what a wonderful way to spend the afternoon. 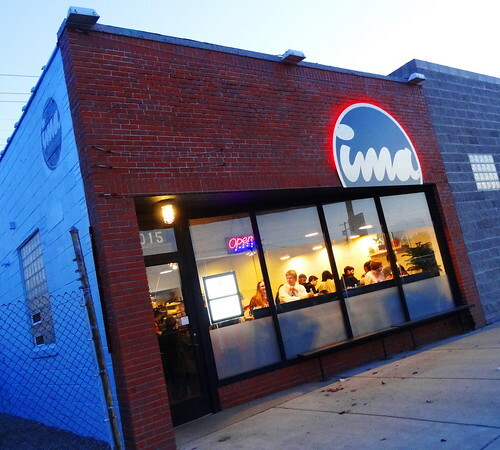 We’re having an early dinner at Ima, a new Japanese-influenced restaurant that took over the old Rubbed space on Michigan Ave. 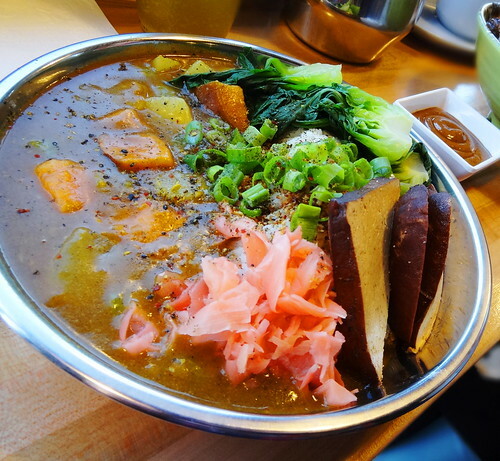 Serving signature noodle soups, rice bowls, curries and small plates, the restaurant has received high praise from diners and critics alike. The communal tables are full but two seats have opened at the bar overlooking Michigan Ave. The menu is simple and concise, making for easy ordering. We are having the Golden Curry; silky curry sauce, root veggies, ginger pickle and roasted tofu, it’s fantastic! 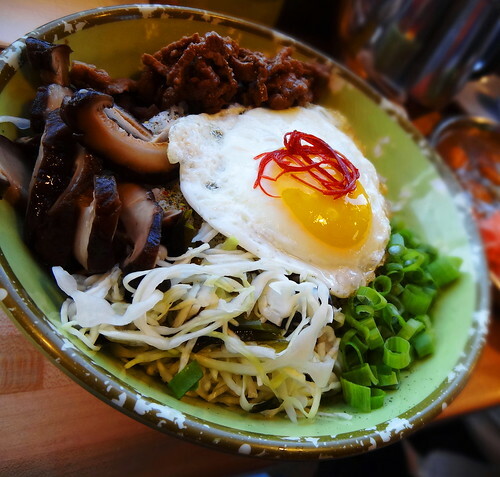 The Boombap is Ima’s version of Bibimbop; a fried egg, shitake, slaw, cucumber, ginger beef all served atop a bowl of rice with pepito chili sauce on the side, it’s outstanding. A line of people waiting has formed, we finish every last grain of rice and we’re off. 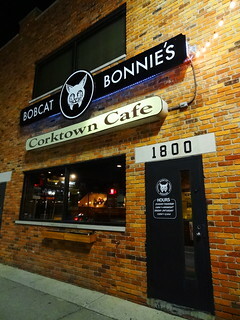 Bobcat Bonnies is on the other side of Michigan Ave, something about the name has always intrigued me, tonight I finally get the chance to check it out. The space was formerly The Red Devil and O’Blivion’s after that, see those names did nothing for me… We’re stopping in at the neighborhood spot for an after-dinner-drink. 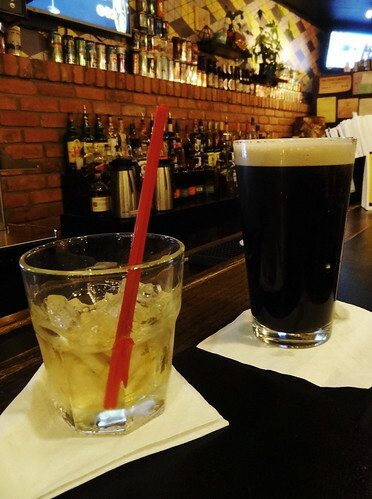 We grab a couple of seats at the bar, order drinks then chat with the bartender and the couple next to us. The place has a very comfortable, chill vibe. 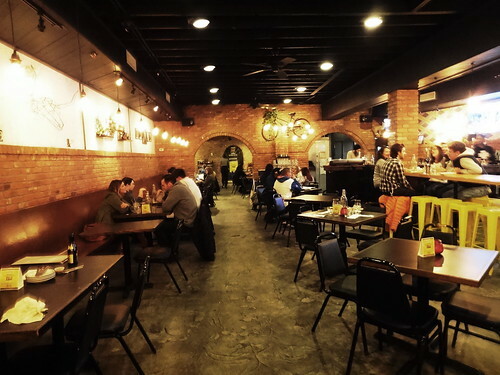 I like the orange brick, the geometric patterns of the tile and the original wood ceiling that’s over 150 years old. This is a nice way to end the evening. Oh and I did find out about the name, Bonnie is the grandmother of one of the partners, rumor has it she likes to drive a bobcat around her farm in Ohio–sweet!